I recently discovered a wonderful wildlife artist named Eleanor Grosch who does similar interpretations to those of Charley Harper, who passed away two years ago. Eleanor is also an illustrator who adds printed patterns to some of her designs, and she was very enthusiastic when I approached her to see if she would allow me to adapt some of her work to canvas interpretations. I chose to introduce her sea gull first because these birds are almost as common in rural and urban areas as they are in shore areas these days. They are also graceful and fun to watch and the irony of embellishing such a common bird was appealing. Ellen’s interpretation suggests the aerodynamics of a parachute or kite as the bird hovers in the air. I have interpreted the bird in several different types of white and soft gray threads and the composite patterns used are somewhat more solid than some of my usual stitch treatments. The two wings have the same pattern, but the foreground wing has some light gray areas to suggest the shadows from the wing overhead as it flaps. The curved outlines were drawn on the canvas and the slanted angles of the lower wing and tail were carefully placed with a ruler to enable a couched outline to fit the oblique angles precisely. A Stem outline was added to the curves of the black part of the wings to keep the sides smooth. A couched white metallic was added around the white and gray areas once the design was completed to achieve a similar smoothness. The fine turquoise lines across the face and wing areas were added on top of the completed patterns in couched overlays of star blue metallic. The gull’s eye (an aqua bead) was added with the same turquoise metallic thread and extra stitches were added on both sides of the laid thread to highlight the area around the eye. Because the black tips of the wings are so narrow with tapered points, they have minimal pattern fillings. The interior areas are filled with Alicia Lace in #12 black Subtlety (silk pearl) to give a light, airy effect. When the wings got too narrow at the base for any pattern, rows of Stem outline were added to fill the narrow space in #8 black pearl cotton (the same weight used for the Stem outlines on the wings). 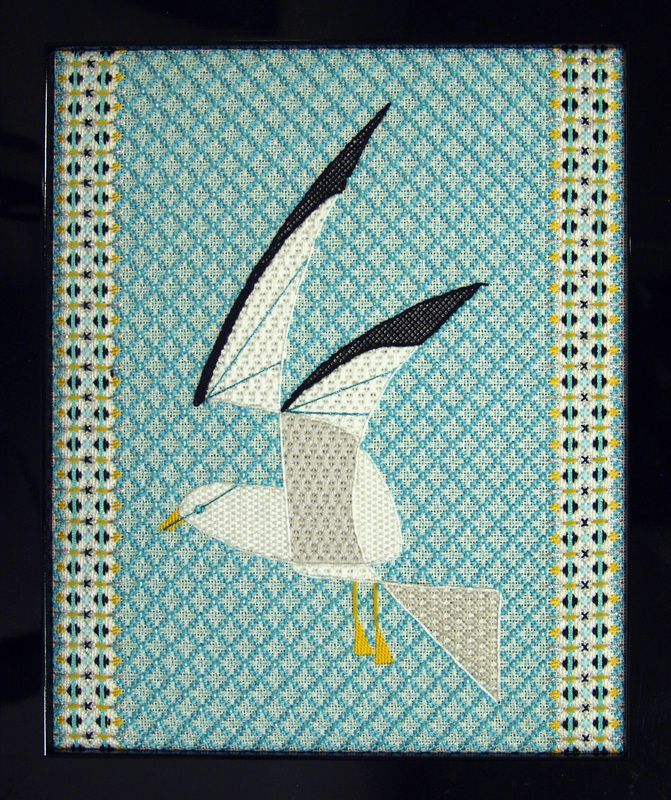 For the body of the bird I used a horizontal Burden stitch, which creates a desirable solid satin stitch appearance with a glint of white metallic between the rows from the laid threads. The angle of the “steps” of this pattern provided a perfect oblique slant for the turquoise laid thread, which is couched across the head. The wings are stitched in an Old Florentine Variation, which is also a satin stitch pattern. In both the white and gray floss areas, mirrored Slanted Gobelin stitches were added in white metallic to provide some glitz as well as additional coverage since there are always canvas peekaboos in this filling. The tall stitches in this pattern reinforce the graceful, elongated shapes of the wings nicely as well. The white wing pattern is still slightly open and the gray floss filling in the bird’s tail is also slightly open with similar white metallic accents. This variation uses a main framework of Horizontal Hot Wheel units with additional fillers of partial Double Straight Cross units in the open areas. The beak and web feet are stitched in simple Encroaching Gobelin, which gives a smoother appearance than Tent. The feet are connected to the bird’s body with couched velour legs in a matching yellow gold shade. BACKGROUND. An open pattern that fits the repeats of the border is used for the background pattern. The main framework has light blue four-way clusters of a stitch that I call “chain link” since the open ovals suggest a short chain. Once this step is completed in aqua or blue #8 pearl cotton, a second four-way blackwork motif is added to the round open areas in a lighter shade of aqua or blue floss. Beads are also added as part of this vertical sequence. BORDER BANDS. These bands are composed of seven steps and the main framework of crosses is composed of clusters of rectangles in Upright Gobelin. Additional fillings include Pavilion Variation, Hungarian Units, Double Straight Cross in Two Colors, Sideways Hungarian, and Vertical Laid Rows with Sideways Gobelin Tiedowns. PREWORK: No advanced preparation is required for this class. COLOR CHOICE: Blues shades to be offered for the aqua in the background and border. TEACHER PROVIDES. All materials needed to complete the design plus a detailed instruction booklet with a color copy of the finished model on the cover and some detail views. MATERIALS PROVIDED BY STUDENTS. 12" X 14" stretcher frame, embroidery scissors, laying tool, clamp or frame weight to secure the stretcher frame to the working table, plus any other normal accessories needed to work on an 18-count ground (light, magnifier, etc.). TEACHER’S CLASSROOM NEEDS. Marker board with accessories or any acceptable alternative. U-shape arrangement for student tables preferred. Need large display table somewhere for exhibit of visual aids. Small table needed in front near board for teacher's notebook and stitched model. 1. To share photos of other adaptations that I have done using sources from commercial artists (with permission) and non-embroidered sources that are in the public domain. 2. To share some of my ways of handling oblique angles and curves gracefully on canvas. Other designs with couched outlines, whipped back stitched outlines and Stem outlines will be displayed and discussed briefly in class. 3. To show some of the ways I design original composite patterns and stitch variations. Most of my pieces have some new patterns as well as variations of older patterns and this style is the hallmark of my recent work. 4. To introduce the concept of a shoelace technique to minimize the number of starting and ending tails. Composite patterns with several steps need to spread out the starting and ending tails as well and this technique avoids any overload in the backings. 5. Some stitch refinements will also be shared so that students learn to produce a consistent appearance to the stitches throughout each pattern.